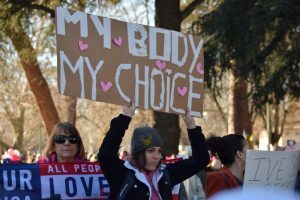 A woman participates in the Woman’s March, holding a sign that reads, “My Body My Choice.” January 20, 2018, Sacramento, California. On June 27, 2018, Supreme Court Justice Anthony M. Kennedy formally announced his retirement. Kennedy, 81, will officially step down on July 31, 2018. This, of course, leaves a huge vacancy that will need to be filled. The president of the United States is ultimately tasked with nominating Supreme Court Justices, as outlined in Article Two of the Constitution. The Senate must then confirm the nominee. Women’s rights advocates worry that President Trump will appoint a Justice who will overturn Roe v. Wade—a 1973 Supreme Court ruling that legalized abortion nationwide. And those fears have real merit. 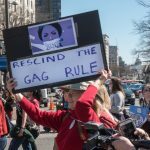 On January 23, 2017, President Trump reinstated the Mexico City Policy, commonly referred to as the “global gag rule.” This law restricts U.S. funding to any foreign non-governmental organization that provides abortion services or referrals. Healthcare workers are forbidden from even speaking about the practice. President Ronald Reagan first enacted the Mexico City Policy in 1984. President Bill Clinton later repealed it. Then, President George W. Bush re-enacted it. President Obama repealed it again. In 2017, President Donald J. Trump reinstated it. The president even went as far as to say there should be “some form of punishment” for women who obtain an abortion. He has also repeatedly threatened to defund nonprofit reproductive health care facility Planned Parenthood because it provides abortion services. But perhaps most telling is a recent Fox News interview in which the president suggested that abortion rights be left up to the state.